Understand where proportional or servo valves are used and how they work. Directional valves are either open or shut, they offer no control of flow rate and their operation can be very harsh, as they move instantly from fully open to fully shut. 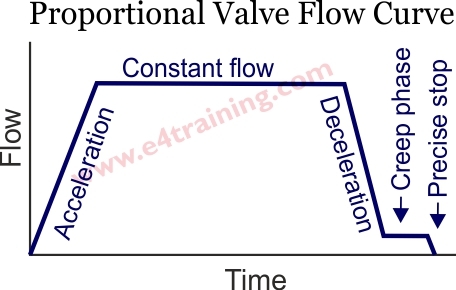 Proportional valves, on the other hand, are used to control the acceleration and/or speed of a load, therefore, providing smooth control of both opening and closing as well as the amount of flow once open. In mobile excavators proportional control valves are widely used to move the arms and buckets smoothly. With mobile equipment, the operator needs a handle that they can gradually start to move the implements smoothly and then have control over the speed at which they move. In industrial applications proportional control valves are used when different speeds are required or used when actuators need to stop in a specific position. They are also used to gradually speed up and slow down actuators so that they don't judder or start harshly. High performance proportional and servo valves are used when greater accuracy or a high-precision of speed, pressure, or positional control is required, often with electrical closed-loop control rather than open loop control. Hydraulic proportional control valves work in a similar way too directional valves except they do not switch from fully shut to fully open. Instead, they gradually open a restricted flow orifice. The size of orifice opening is proportional to the amount of spool movement, either controlled by the electrical solenoid or the hand lever. In this image, you can see a directional spool switching (on top) and a proportional spool gradually opening (below). The proportional spool has a triangular notch that gradually opens a flow control orifice as it moves. Flow is proportional to the valve opening although the actual flow will vary as the load or supply pressure changes. It's useful to think of hydraulic control valves as a braking technology rather than a driving one. The can be compared to a car's brakes rather than its engines. Valves, like brakes, are much smaller and control the vehicle's load by throttling or decelerating rather than accelerating, like an engine. With a manually operated proportional valve you simple control the position of the spool with the position of the operating handle. Mobile control blocks often use proportional pilot pressure control valves on the ends of the spools. This allows remote pilot pressure control handles, to be located away from the valves. Industrial proportional control valves more commonly use direct electrical actuation with PWM (pulse width modulated) power control to the solenoids. The electrical signal controls the force the coil exerts against the spring on the far end of the spool, and therefore the spool position and orifice size. There is generally a proportional version for each type of hydraulic valve e.g. directional, pressure, flow, poppet and spool valves. See our symbols sections for more details. Circular notched, manually operated proportional valves are used extensively to control mobile equipment such as excavator arms. Proportional pressure reducing valves are used to remotely operate mobile control blocks and spools are regularly cut with different opening ratios to provide more consistent raising (less restriction) and lowering (more restriction) speeds. 3Hz to 1000Hz system natural frequencies with 20Hz to 400Hz valve natural frequencies. Pressure and flow control accuracy ranges. The performance differences are achieved by the use different or higher quality features inside the valves, including, different shape and accuracy of spool notches, longitudinal accuracy of the spool and body lands including the overlap and underlap tolerances, the use of spool sleeves to allow higher spool land tolerances, internal valve electronics providing closed loop position control of main and/or pilot spools, servo valve torque motor and flapper valve, higher performance solenoids. There are a huge range of different quality and performance valves available and careful selections in very important. Learn more about proportional control valves in our 'Professional Training Section'. Understand their design features, performance limits, and how to specify proportional and servo valves.